Tigers are the largest of all the cat species. 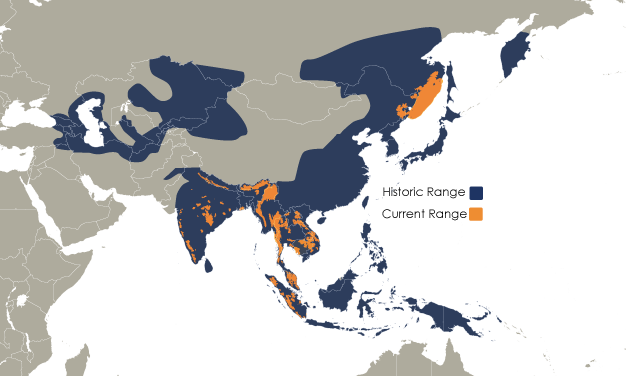 Of the nine tiger subspecies, three are now extinct (Javan, Caspian, and Bali). There are only about 3,800 tigers left in the wild. Tigers are now listed as endangered, mostly due to poaching and habitat loss. Every hour, an area the size of 300 football fields is destroyed in many of the subspecies’ habitats. At this rate, wild tigers will lose their habitat entirely in the next few years. Much of the remaining tiger habitat is being clear cut for palm oil plantations. Palm oil is a very easy and cheap crop to grow and, as a result, it is now an ingredient in over 50% of consumable goods. The average lifespan for a tiger in the wild is 8 to 10 years. In captivity, they can live between 15 and 18 years. Tigers are the largest of the cat species. They have large front legs to help them pull down their prey. Tigers can range from 300 to 700 pounds. The largest subspecies is the Siberian Tiger, weighing up to 700 pounds. Female tigers are smaller than their male counterparts. Tigers stand between 3 and 3 ½ feet tall at the shoulders and range between 4 ½ and 9 feet long from the tip of their nose to the tip of their tail. Tiger tails can be up to three feet long. Tigers are known for their orange, reddish orange, or pale orange coats that are patterned with black stripes. Each tiger’s stripes are unique. Tigers have white bellies and white around their muzzles. Tigers also have white spots on the backs of their black ears; this is a trait that all spotted wild cats have, which helps them to communicate with their young. Tigers are solitary animals that typically only come together to mate. Tiger cubs will stay with their mothers until they are about two years of age, then they will go off and find their own territories. They are primarily nocturnal hunters, preferring to hunt at night when they have a better chance of sneaking up on their prey. Tigers are excellent swimmers and some have been known to spend the majority of their day in the water. They are also very skilled at hunting from the water. Tigers live in a variety of habitats, including swampy mangroves, dense forests, rocky country, and woodlands. They prefer having cover to hide behind as they ambush their prey. Habitat loss and poaching continue to be the major threats to wild tigers. Many people view dead tigers as extremely valuable, using every part of their bodies in some way. Tigers are also losing a great deal of their habitat to farmers and palm oil plantations each year. In the last 100 years, the population of wild tigers has dropped from 100,000 to 3,200. 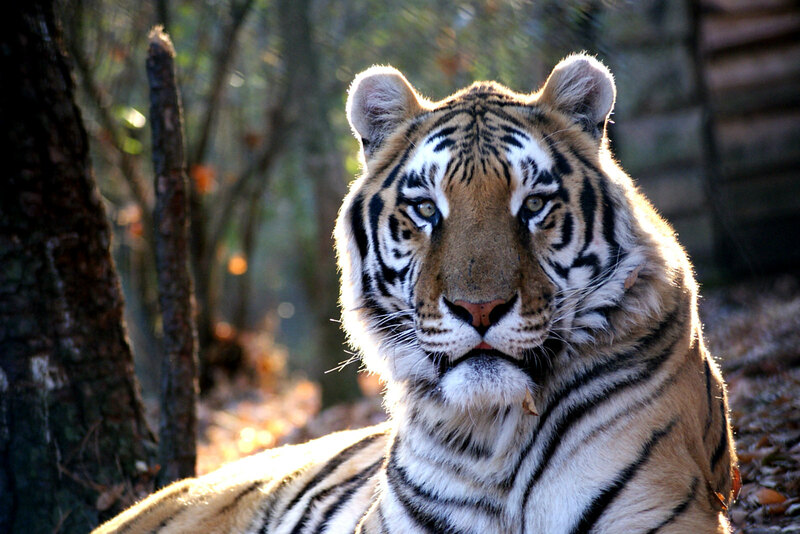 Tigers live in a variety of habitats in Southeast Asia, China, and the Russian Far East. They live in swampy grasslands, dense forests, woodlands, and rocky country side. Tigers are obligate carnivores, meaning they have to eat meat to survive. Tigers primarily hunt deer, wild boar, water buffalo, and antelope. Tigers have been known to hunt sloth bears, leopards, domestic cattle. Tigers who were sick, old, or injured have been known to kill humans. Tigers typically mate in the spring. A mother’s gestation period is about 103 days and her litter size is usually between three and four cubs. Tigers are solitary animals that typically only come together to mate. Tiger cubs will stay with their mothers until they are about two years of age, then they will go off and find their own territory. They are primarily nocturnal hunters, preferring to hunt at night when they have a better chance of sneaking up on their prey. Tigers are excellent swimmers and some have been known to spend the majority of their day in the water; they are also very skilled at hunting from the water. Tigers are considered an umbrella species; if the tiger is saved, then millions of animals and plants that live in their territories will also be saved. Specific countries are working to conserve the tiger’s habitat but have a difficult time dealing with poaching and the governments that place more value on a dead tiger than a living one. One way to aid in tiger conservation is to limit your consumption of palm oil. Palm oil is one of the leading causes of the decline in tiger population. Palm oil is found in over 50% of consumer goods, in products like food, shampoo, and lotions. Palm oil is cheap to grow, so many forests are being clear-cut to make room for more palm oil plantations.